with recipes and the weekly Mediterranean meal plan via email. Your Privacy is Safe, We Hate Spam! The Mediterranean diet is not a “diet” per se. It is a mix of the traditional eating habits of people living in Spain, Italy, France, Greece and the Middle East. 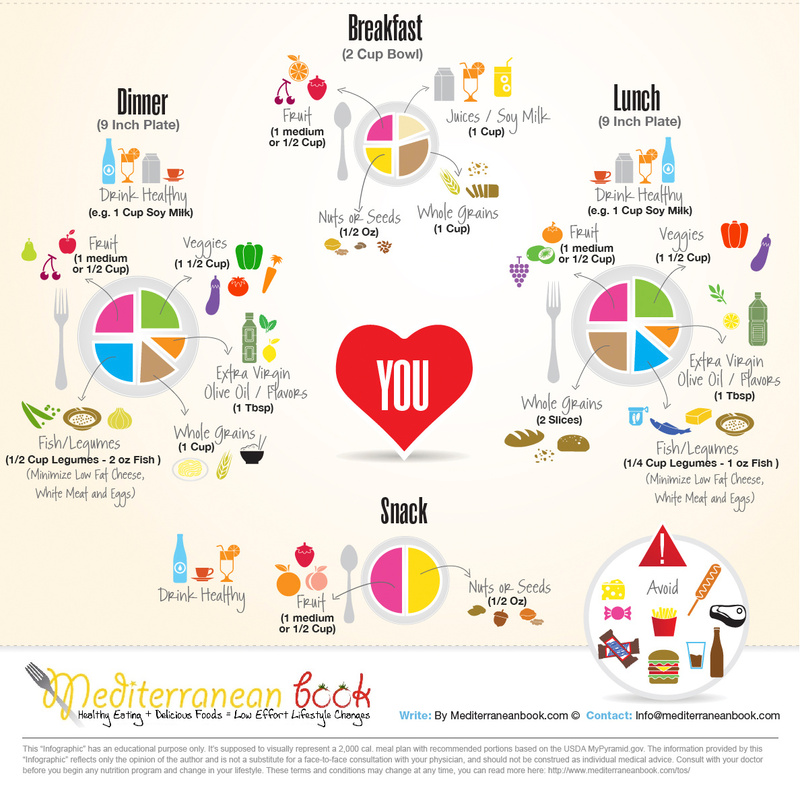 How to Start the Mediterranean Diet? Eat natural, unprocessed foods like fruits, vegetables, whole grains and nuts. A lot of scientists believe the Mediterranean Diet is the gold standard in healthy eating. New studies appear regularly on leading scientific journals, supporting the healthfulness of the Mediterranean Diet. Cancer: A lot of studies confirm that some foods may modify estrogens level. Consuming dairy foods may increase the risk of prostate cancer as well. Osteoporosis: People from the Mediterranean countries have lower rates of hip fractures. Fresh fruit. Have 3 or 4 pieces of fruit every day. Make one of these fruits an orange; they are very high in antioxidants and phytochemicals, substances that protect us against diseases. Berries (such as strawberries, blueberries, raspberries) are also a must in this diet because of their antioxidants. Antioxidants are essential in the fight against heart disease and cancer. If you want to follow a Mediterranean diet, eat some fruit for dessert. That is how Mediterraneans eat their fruit most of the times. Veggies. Have a salad in your main meals. Use olive oil and lemon for dressing; This is a powerful antioxidant combination. Tomatoes and tomato products are a staple food in the Mediterranean diet; they contain lycopene. Cut a whole tomato and spread it with olive oil and some basil as part of your side dish or include them in your salads. Sauté green beans with olive oil and garlic to have a complete Mediterranean side dish. Zucchini are also a delightful complement; sauté them with olive oil. Whole Grains. Have a piece of whole wheat or whole grain bread with your main meals (except with pasta). Have whole wheat pasta 2 or 3 times a week. It is low in calories, and the fiber enhances the feeling of fullness. Legumes. Eat dried beans, lentils, or garbanzo beans 2 or 3 times a week. Nutrition experts at the Michigan State University tell us that eating 2 to 4 cups of cooked legumes every week can protect us against heart disease. Dry beans have fiber that eliminates cholesterol from the body. Eat legumes and a piece of whole grain bread to have the perfect protein. Vegetable protein does not put a load on kidneys as animal protein does. Nuts. Have a handful of nuts as a snack in your morning break. Nuts are also a staple food in Mediterranean countries and are high in monounsaturated fat, the one that does not get stuck in the arteries. Read the food label and be aware of portions because nuts are high in calories. Scientific studies have found that almonds and walnuts are the healthiest choices. Olive oil. Use olive oil in your meals both to cook and as a condiment in your salads. Olive oil is the main source of fat in Mediterranean countries and is the “cause” of the low incidence of heart disease in those countries. Use olive oil and lemon as a dip in your salads. Fish and sea food. Have fish and sea food two or three times a week. Salmon and sardines are excellent choices because they provide omega-3 oils, oils that the body needs but cannot create in enough quantities. Garlic and aromatic herbs. Use garlic and aromatic herbs as condiment. Garlic is the leading contributor to the low incidence of high blood pressure in Mediterranean countries because it dilates the blood vessels walls. A 28 day diet plan would introduce changes gradually. Studies have shown that small changes over time are an effective way to make lifelong habits. Start with the elimination of processed foods and increase fruit and vegetable. Continue by adding more beans and switch from other oils (or butter) to extra virgin olive oil. Limit seafood, poultry and eggs to a few times per week each and reduce red meat to no more than a portion a month. And finally focus on dairy products and avoid milk, cream and butter. Eat a minimum of five servings of fruits and vegetables daily. Choose foods rich in fiber, vitamins and phytonutrients. Eat legumes at least 8 times a week. Legumes are a low fat, fiber filled and a good source of protein. Limit refined grains and choose whole grains. Lower fat dairy options should replace full fat dairy products. Olive oil would be limited to a tablespoon per day. The human body requires dietary fat, and plant based olive oil is a heart healthy choice. Fish, eggs and poultry should be limited to no more than two servings each, per week. These are good sources of protein but contain more calories than legumes. Wine should be limited to one glass per day. A four ounce glass of red wine is full of antioxidants but contains 100 to 120 calories. Eat fruit for dessert. Consume no more than 2 eggs a week. Replace butter with olive oil for cooking. Use honey to sweeten (no sugar). Eat red meats once a month. Put in 30 min. of moderate physical activity each day. A nice breakfast idea would include a 1/2 cup serving of oats with fruit or granola with milk. Greek style yogurt with fruit and nuts is a great choice for yogurt as it contains more protein than regular yogurt. An even higher protein choice might include a vegetable filled egg white omelet with whole grain toast. Lunch would account for 350 to 400 calories. As always, emphasize fresh and minimally processed foods. Lunches would be made up of bean based soups, salads with beans and an olive oil dressing, light seafood or poultry dishes and whole grains. Hummus and vegetables in a whole wheat pita is an example of a plant based sandwich that would make a tasty lunch option. Ideally lunch should include at least three fruit or vegetable servings. Dinner would be in the 400 calorie range. Dinner options are virtually identical to lunch, with an emphasis on fresh vegetables, legumes and whole grains. For variety, grains like Quinoa, though not traditionally Mediterranean, can be used in salads or as a side dish. Again, dinner should include at least three fruit and vegetable servings. Grilled fish and vegetables make a delicious dinner choice. A 50 to 100 calorie snack of a few nuts, vegetables or fresh fruit would complete the daily calorie intake. Some delicious breakfast options would be a high protein Greek style yogurt with granola and fruit topping, a spinach and tomato omelet made with a combination of whole egg and egg whites accompanied by fresh fruit. Steel cut oats or other whole grain hot cereal with fruit is also an excellent choice. Lunch would be approximately 500 calories and focus on fresh foods and legumes or lean protein. An example of a lunch that would fit the Mediterranean diet is a grilled vegetable medley served over polenta, accompanied by a side salad with feta. Both lunch and dinner should include a minimum of three vegetable servings. Dinner leftovers make an easy lunch the next day. Dinner options are the same as lunch, with the focus on nutritious, unprocessed foods and at least three vegetable servings. Fish or chicken with rice, vegetables and a salad makes an easy but elegant dinner. For busy nights, bean soups could be prepared ahead and easily reheated. Serve the soup with salad and whole grain bread for a quick comforting meal. A single glass of red wine can accompany dinner. The rest of the calories would be made up by two 100 calorie snacks. Yogurt, whole grain crackers or fruit make healthy snack choices. Who Invented the Mediterranean Diet ? The history of the Mediterranean diet has millenarian origins. Its principles were already in use from the 4th century under the roman empire. The diet attracted international interest after a study conducted by Dr. Ancel keys at the end of the Second world war. Dr. Keys noticed how the population in the Cilento (southern Italy), had a greater longevity, minor incidence of heart problems and cancer. The Doctor understood that it was due to the alimentary regimen they followed. Then he decided to undertake a study “Study of the seven countries” in order to verify the health similarities of different Mediterranean populations. Ancel Keys lived in a small village of fishermen (Poplars) in the common of Pollica in the province of Salerno, Italy for 40 years. He passed away in November 2004 at 100 years age. © Copyright 2015 MediterraneanDiet.org.uk · Admin · Please see our Terms & full legal disclaimer for more information on typical results, risks, and our full testimonials disclaimer. (*) Disclaimer: Results may vary, and testimonial are not claimed to represent typical results. In addition, you assume certain risks inherent in a nutrition program. Enrico and Valerie are not doctors, and their advice is not a substitute for medical advice. Consult your physician before beginning any nutrition program. However, Enrico and Valerie cannot guarantee your results with the Mediterranean eBook. The stories you see on this page are real. However, it must be disclaimed that these testimonials are not claimed to represent typical results with the program. They are meant as a showcase of what the most motivated and dedicated clients can do with the program. Your results may vary, and you may not get the same results when using this program due to differences in your individual exercise history, genetics, and personal motivation.